There have been a handful Indian movies that have surprised me (remember me gushing about this film? 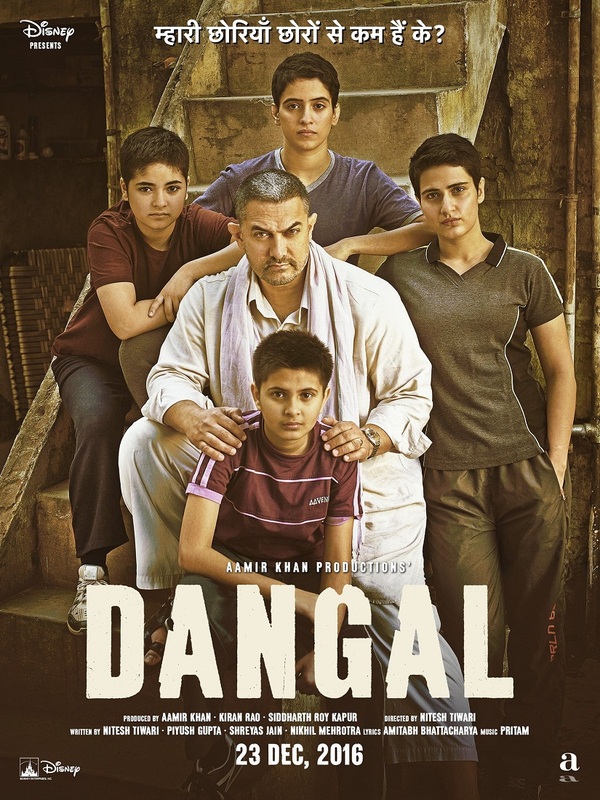 I just realized that I've never written a proper review on that movie), and this movie, which is also starred by Aamir Khan, has made it into my favorite movie of the month. Aamir Khan, as usual, is a wonderful actor. The 51-year-old star switches body weight for his role. He went from 97 kg - as the older version of Mahavir - to an impressively toned body with just 9 percent body fat - as the younger Mahavir. Dangal follows the efforts of Mahavir Singh Phogat, a former professional wrestler, to train his daughters Geeta and Babita to be wrestler. Having to quit wrestling due to financial problems, Mahavir wants to have a son to be his successor. But when he learns that his daughters beat up boys, he quickly realizes that the girls can be female wrestlers. Also, when Geeta enters the national training club but has yet to win in any competition, it is Mahavir who reminds Geeta that her wrestling style is progressive, instead of defensive, which is advised by the national coach. She follows her father's advice and soon wins competitions. The girls start their day early from 5 a.m., with running, swimming in the river, and heavy lifting. But then, their diet is another issue. To make the girls stronger, they need to eat meat, and meat is expensive item for the family of six. Mahavir persuades a local chicken vendor to give massive discount under the condition that if the girls start winning competition, the vendor can claim their success is partly due to the chicken he sells. Mahavir is very strict with the training schedule, and he is furious when he learns that the girls skip training to attend their school mate's wedding. One of the most touching scenes is when the girls pour out their hearts to the school mate, saying that their friend is lucky to not have a father like theirs. "I wish I have a father like yours. He is strict, but he has concerns on your future. He wants you to be successful wrestlers. My father only cares about getting me married at the age of 12," their friend says. Also, when the girls' mother asks Mahavir: what if there is no man who will take the girls as wives? Mahavir replies,"I will make the girls have more power so that they don't wait for the men, but they will choose the men." Mahavir has successfully created a revolution of women's wrestling in what has been a traditionally male-dominated sport, but also doing it in a state known for its gender inequality.